In late 2017, the Nature Conservancy of Canada (NCC) put out a call to the public to help protect this spectacular natural area. Many donors — both local and across Ontario — stepped up to help. A big thank you to all the individuals, groups and organizations that made this project possible. The project was generously supported by funding from the Government of Canada, through the Natural Areas Conservation Program. The Frontenac Arch is the southern-most extension of the Canadian Shield extending from the Algonquin Highlands of Ontario to the Adirondack Mountains of New York. This rugged landscape was settled after the War of 1812 but was ill-suited for agriculture. Most of the farms carved from the forest have returned to nature and this is now the most heavily forested landscape in southern Ontario. It is also the most vital link in the last remaining intact forest corridor in eastern North America. The Frontenac Arch is a unique area of biogeographic overlap between the northern Canadian Shield forests and southern Appalachian influences, supporting a great richness of plant, insect and animal species and making this one of the most biodiverse regions in Canada, and a place of great beauty. The Arch serves as a funnel for migrating birds, bats, and insects, and animals with large home ranges such as the fisher, black bear and bobcat. 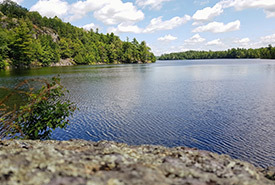 The Frontenac Arch’s incredibly rich natural environment and history was recognized in 2002 when it became a UNESCO World Biosphere Reserve, part of a world-wide network of 669 Biosphere Reserves in 120 countries. Click here to help support more great work in the Frontenac Arch.